Ear piercing is a very popular procedure that can be performed by non-medical and medical professionals. Earlobe piercings are most common, although other parts of the ear, including areas with cartilage, can be pierced as well. Body piercings in the nose and belly button are popular, too. Have you had keloids or large scars? Do you have a family history of keloids or large scars? Keloids are large scars that spill over the border of the area of trauma. If you have a personal or family history of large scars, your risk of developing a large scar after the piercing increases. Do you have allergies to metal? If so, which metals? Earrings are made out of several different materials. Typically starter earrings are made out of sterling silver, which is a widely non-irritating metal. If you have known allergies to certain metals, you should definitely avoid those metals. If you don't, you can develop an ​allergic reaction, including redness, swelling, irritation, itching or pain, even after the piercing has healed. Additionally, the cosmetic appearance of the piercing may suffer as a result. A common metal that people are allergic to is nickel. Where on your ear should you get your piercing? 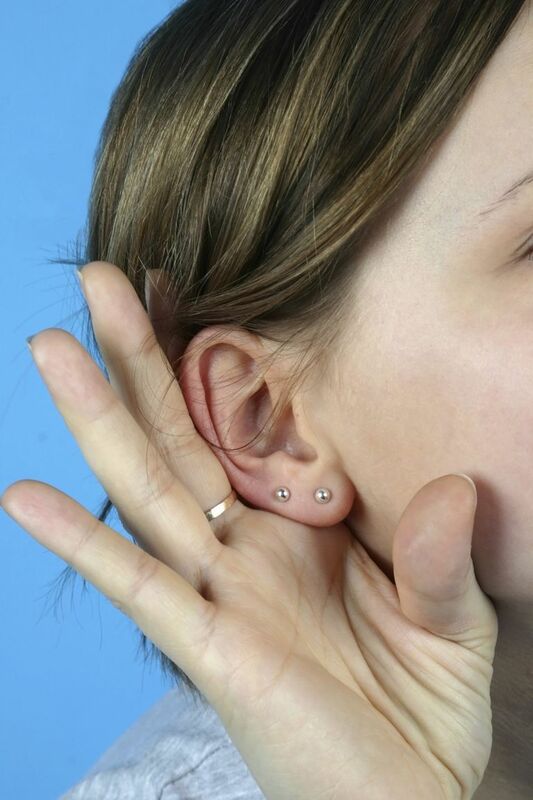 The earlobes are most often the first part of the ear pierced. Take a look at your ears. Most people have some degree of asymmetry. You'll want your earrings to be level with one another. Additionally, you don't want to place the holes too low on the earlobe, as that could lead to splitting. Additionally, the hole can be placed perpendicularly to the surface of the ear or at an angle. Sometimes people will opt for the hole to be placed at an angle so that the earring faces forward. Decide what style of starter earring you want. There are quite a few different techniques for piercing ears. Local anesthesia may or may not be used prior to the piercing procedure. Ice may be used before the procedure to achieve some numbness as well. Ear piercing kits. Many jewelry stores and ear piercing professionals use commercial ear piercing kits, also known as "guns." Ear piercing guns have embedded studs that will automatically lodge into the piercing hole after the trigger is pulled. One needle technique. In this technique, a hollow bore needle is inserted through the desired spot for the earring. The post of the earring stud is inserted through the hollow bore of the needle and the needle is withdrawn, leaving the stud post in place. The earring backing is then placed to secure the earring. Two needle technique. A smaller needle is used to make a tract in the desired area of the hole. A larger hollow needle is then slipped over the smaller needle in the opposite direction and the smaller needle is removed. The post of the earring stud is inserted through the hollow bore of the remaining larger needle and the needle is withdrawn, leaving the stud post in place. The earring backing is then secured. Should You Pierce Your Ears at Home? In a word: no. Although you can purchase sterile needles, starter earrings and ear piercing kits, having a professional perform your ear piercing decreases the rate of complications such as infection and improper placement. Any piercing, no matter who administers it, is a risk. Shopping mall kiosks are generally safe places to get your ears pierced, but it's still a risk. You can schedule an appointment to have your ears pierced by a dermatologist or other healthcare professional. Make sure to follow the instructions provided by your ear piercing professional. Starter earrings need to be left in for several weeks in order to heal. The exact length of time may vary depending on what part of the ear is pierced. You will also likely be advised to clean the piercing with a sterile saline solution and rotate the piercing's post in order to prevent it from getting stuck. There are a few complications that can arise with a new piercing, even if it's being properly cared for. Infection, pain, inflammation and allergic reaction can occur. The piercing can become embedded in the hole, low earlobe piercings can split and scarring can form. Avoid these complications by routinely cleaning and caring for your piercings.